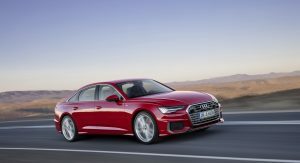 Borrowing heavily from the larger A8 and sportier A7’s styling and bursting with high tech, Audi has introduced the eighth generation of its A6 sedan, following a leak earlier today. Starting up front, there’s a wide singleframe grille which is surrounded by large air intakes and angular headlights. 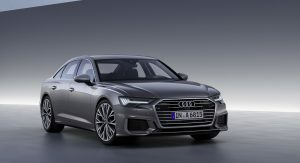 Speaking of the latter, the A6 will be offered with three different headlights including range-topping HD Matrix LED lights that have distinctive daytime running lights. 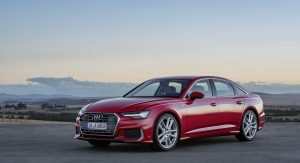 Moving further back, the model has been equipped with sportier bodywork and new character lines which give the sedan a more muscular appearance. Continuing to the rear, there’s an integrated trunk spoiler and optional LED taillights with nine vertical segments. 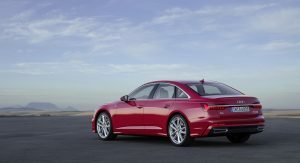 The A6 is slightly larger than its predecessor as it now measures 4,939 millimeters (16.2 ft) long, 1,886 millimeters (6.2 ft) wide and 1,457 millimeters (4.8 ft) tall with a wheelbase that spans 2,924 millimeters (9.5 ft). 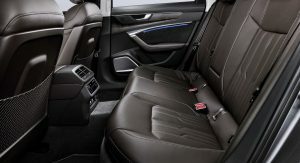 Thanks to the increased dimensions, the all-new model offers more rear seat legroom as well as additional head and shoulder space. 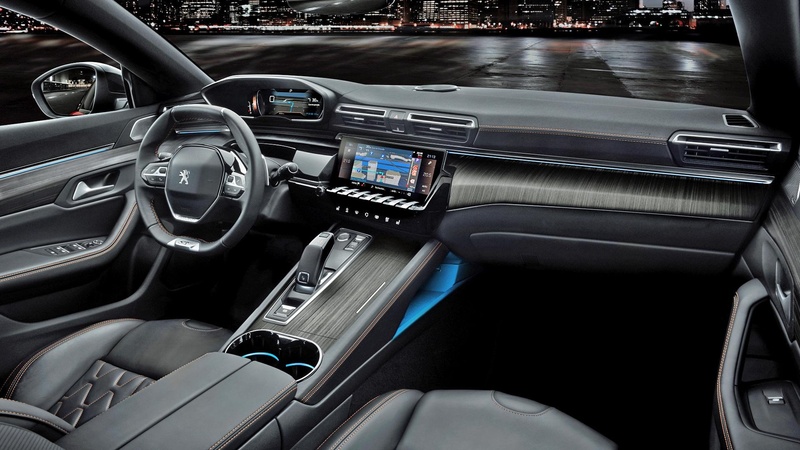 The cabin largely carries over from the A7 and this is a good thing as it has a futuristic design which combines high quality materials with premium accents. In range-topping models, drivers will find a 12.3-inch digital instrument cluster, a 10.1-inch infotainment system and a lower 8.6-inch display which provides access to climate control and other convenience features. 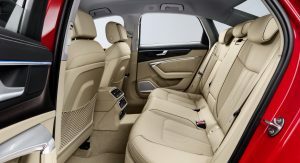 The car also has all-new seats which offer heating, ventilation and massage functions up front. 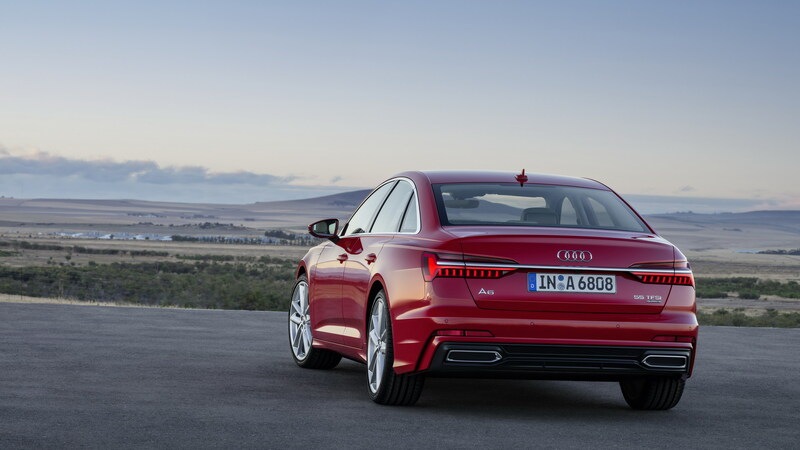 In Europe, the A6 will be launched with two different engines. The turbocharged 3.0-liter TFSI V6 develops 340 PS (250 kW) and 500 Nm (368 lb-ft) of torque. 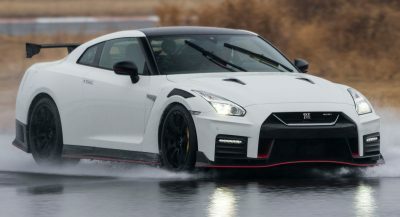 It is connected to a seven-speed S tronic transmission and a standard all-wheel drive system which enables the sedan to accelerate from 0-100 km/h (0-62 mph) in 5.1 seconds before hitting a top speed of 250 km/h (155 mph). Diesel fans can opt for the 3.0-liter TDI V6 which produces 286 PS (210 kW) and 620 Nm (457 lb-ft) of torque. This unit is paired to an eight-speed tiptronic transmission and a quattro all-wheel drive system. 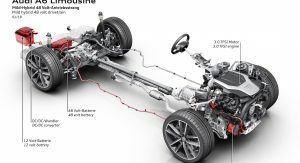 Regardless of which engine is selected, both have a mild-hybrid system which consists of a belt-alternator starter and a lithium-ion battery. 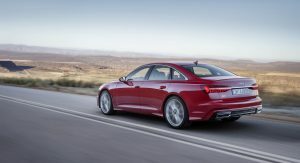 Audi says the system helps to reduce fuel consumption by approximately 0.7 L/100km. 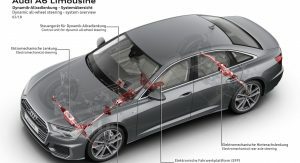 On the topic of performance, Audi says the new A6 is “noticeably sportier than the outgoing model” as it has improved suspensions and a progressive steering system that becomes “even more direct as the steering angle increases.” Suspension choices include everything from basic steel springs to an adaptive air suspension with controlled damping. Buyers can also order an optional sport differential and a sport suspension. 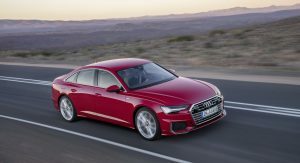 The 2019 Audi A6 will be launched in Germany this June and pricing for the A6 50 TDI quattro starts at €58,050. Makes me wonder why they can’t have Gorilla glass kind of surfaces instead of shiny plastic, that would be scratch resistant and with some oleophobic coating no more greasy finger traces. They were probably thinking of EVs when they did that lol. The fake exhaust goes with the giant fake grilles in the front bumper. Fakery – it’s a design theme. spend all that money for fake exhausts and they use the cheap net on the back of the front seats. The netting has been an Audi thing for years. Are you really focusing on the right fake? Look at the front instead. Again with the fake exhaust. What’s the point? To break up the expanse of plastic on the bumper and to keep the design cohesive. I guess my whole comment about keeping the same graphic for various engines and their exhausts means nothing. They could.. as we all can do many things but for them this just simplifies the process. If you have diesels, mild hybrids, 4 cylinders, 6 cylinders at some point electric this just keeps them from making multiple bumpers and cutouts for them. You may not agree and that’s fine but this is why it exists. That’s not an counterpoint. Because what you precieve to be I guess a low quality vs high quality car company is why they shouldn’t have faux exhausts? This is clearly nothing more than personal feelings to which nothing I say will be a reasonable explanation. Sorry, didn’t see your comment below. Point taken. But Audi and other luxury brands (looking at you Mercedes-Benz) shouldn’t use visual fakery as much as possible. 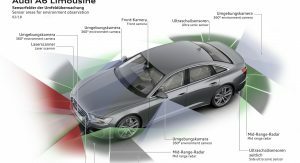 If I’m paying Audi A6 money for a no excuses car, I don’t care what simplifies their process. Let’s face it, car styling is about faking, and most people don’t even notice. I can’t wait for the fake grille trend to die. It looks terrible, and it’s just ridiculous. 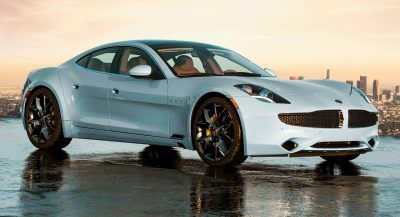 The funniest version is Tesla – removing the fake grille because “electric cars don’t need them” and then keeping THREE air intakes in the front. So a Tesla actually has more air intakes than some combustion cars from the 80’s! I agree! I like the car, I’m a fan of Audi…and just think at this price point Audi could / should provide some option to those of us that don’t like fake exhaust outlets. When buying “expensive car” actually EVERYTHING is important. Unless you’re willing to spend a lot of money for something you don’t want. Which is why I think this feature (fake versus real exhaust outlets) should be optional! I didn’t say it was “the most important thing”! But reading this threads someone would assume that fake exhausts are the most important things. They are not. I didn’t assume that. I read some are okay with it and some are not. Which is why I think offering an option would be a solution….especially at this price point. Otherwise I like it! And expect the aftermarket will offer up alternative real exhaust – so for me it’s not a deal breaker. I actually really like this. The new Audi design suits this car better than it has the A8 and A7. 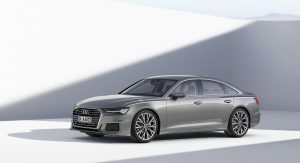 It may not be a revolutionary change, but that’s not a bad thing at all because the outgoing A6 was and still is a very good looking car, and this just elevates that. Nobody expects Audi exterior design to be revolutionary anymore. But some would like it to be evolutionary. Nowadays they are just changing it, not improving on it. If I was to pick the best looking A6, it probably would be this. And if the latest version isn’t the best, why would I buy it? The interior is fantastic! The character lines above the wheel wells look awkward but ok on, what’s arguably almost an unchanged exterior. But WTF is up with those fake exhaust outlets?!?! They look ridiculous! Seriously, how much is this car going to cost and how much more would it have to cost to make those real? Why does it matter the costs? Do you say to Tesla where is the exhaust on the model S/X/3. No because they are electric cars. 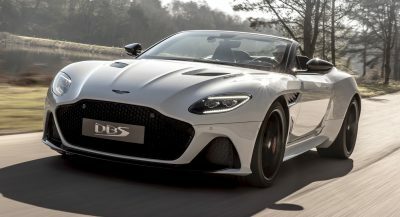 The point is for cohesion in that they don’t have to make specific parts for diesels, hybrid, one exhaust, dual exhausts engines and it breaks up the expanse of bumper visually making the car look better in the rear. I have a pet peeve with manufacturers making cars with gas engines with no exhaust tips or in this case fake ones. Maybe some people out there like fake exhaust or no exhaust tips and that’s good for them. But for me, if I’m expected to pay a lot of money, I want what I want and that’s real exhaust tips on a car with a gas engine. I’m not sure why you mention Tesla since, as you say, they have electric motors. A better example would be the Acura TLX or the old BMW 7 series where they had no exhaust tips. I think it looks cheap and lazy to have these fake tips on there and, for the money, I’d be way more impressed if they opened up that fake outlet, lined it in metal to handle the heat and then route the exhaust system to the tip. You could do this regardless of what engine is in it and it would look much better than just putting chrome colored plastic rectangles on the rear bumper. I mentioned Tesla because you made a comment about how much does this car cost. Well the Tesla model S starts about the same and can go over 100k but because it’s an electric car it gets a pass. 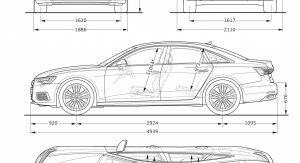 With cars varying in power trains it just a method of simplifying the rear elements. It’s absolutely fine that you want what you want (I believe many of us do) but it serves no purpose other than just a desire. And while your suggestion may be more impressive to most people it’s still subjective. I am just offering a rationale to why fake exhaust exists and trying to understand why that is a make or break for so many people. What intrinsic quality about real makes or breaks a car? Is it because you grew up on it. Is it because the more pipes you have you can tell how big the engine is? This seems to be deep routed issue for most and maybe it because you connotative that to power, to youth, to prestige. I don’t know. Are you the designer of said fake exhausts? There is a strong defensive game being shown here. We understand the cohesive theme and uniform parts etc. The people just want some function with the form. Would Porsche do this? I am not the designer of said parts and it’s funny that you see my factual argument as being defensive. The emotional argument that some of you are putting up is more defensive. I just offered a logical explanation as to why something was done. By all means feel how you feel. You guys are right. I guess I am nostalgic for the past. 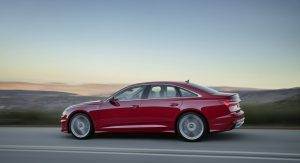 Audi sells ~95k of their a6 line in europe/us each year. 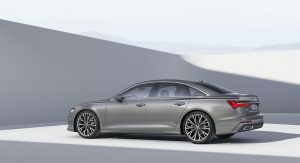 Say there’s 10 items that the a6 doesn’t come with that would cost Audi on average $25 extra per item to make & for each one of those excluded items it’s only 10% of a6 buyers who really wished their item was included. 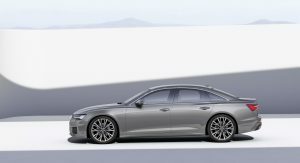 If Audi decided to make all 10 items for the a6, that would be an extra cost $23.8 million per year for Audi for the a6 line. Am I the only person who thinks the interior in this new A6, as well as the A7 and A8, is bordering on gaudy? Probably not the only one however I disagree with your opinion. As you’re entitled to. I just find the combination of the dual touchscreen layout with glossy piano black, polished wood veneer, and brushed aluminium trims to be overwrought by Audi’s normally very restrained standards, and bordering on tacky. I apologize, I thought you meant exterior but you clearly meant interior. I do prefer the last generations interior much better. While I like the darker interior on the newer model, I agree with the touchscreens. I don’t care for them, finger print magnets as well light refelectors on sunny days. The last generation looked so much cleaner and well laid out. I hate the interior. It’s a mess. How can “piano black” STILL be a thing? When is the last time you saw a piano made out of cheap black plastic? The touch screens are awful, and the color-changing light pipe is straight out of a Pep Boys catalog. Maybe they should add some drag if it means a non-bar of soap look. For the record- it looks the best of their current crop. 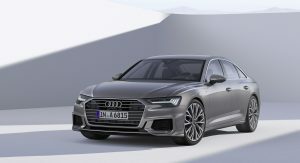 Yes, more bland design evolution from audi, as this looks like all the others, BUT, the A6 has always looked “just right”, and this car hides the required high beltline (safety standards) better than most. Before the first gen A7 was their best looking car, but it is now butchered, this may be it now. I think it looks better than the new A7 and A8. The profile of the grey one with those presumably 21’ rims looks great but overall I am not impressed. Looks typical Audi so I’ll just keep my 2011 A5. i might be the only one, but i dont care for Audi’s new interiors. But tbh I actually think this is the best looking of Audi’s new design. I LIKE THE SEATS (PIC 9&10)THE REST, MEH. Oh shoot, I forgot about Audi’s new stupid nomenclature. It’s not bad looking and I bet it’ll look great in real life.. loving the interior..hate the fake exhaust thing like everyone else..
It’s fine but that fake exhaust is tacky. It would have been better if those were real. Oh, well, I’m pretty sure the next RS6 will look better than this with functioning intakes. 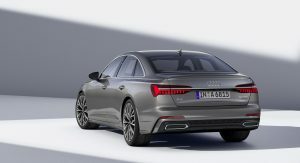 even though this looks exactly like the A8, and that the A8 looks so underwhelming and forgettable, that same design works so well on the A6. i can’t believe im saying this, but i really like this. and i all but despise Audi. Audi is getting on my nerves with these fake exausts. IT NEEDS TO STOP!!!!!! I’m pretty sure real ones are if you get too close and inhale deeply. Those fake vents and exhaust piss me off. Overall, it’s fine. It’s not something that I can really dislike honestly, unless I want to nitpick. I see Audi’s relentless march to mediocrity continues! Germany car designers has got to be some of the laziest bunch around.. I fondly remember when Audi use to turn heads,now we are left shaking them instead. What a wasted effort…. By far the best looking Audi sedan. The proportions are great, the last car was already a stunner so I’m happy they kept it the same. It’s getting really weird with all those screens. Exterior looks nice, except…I don’t “get” all the extra lines. I guess this must be part of their new design language, but it doesn’t seem to be consistent with their Prologue concept or general philosophy of simple, clean, minimal aesthetics. For those saying this is just the same ol’ same ol’ Audi “sausage”…I don’t know, take a look especially at the rear proportions and shapes and details…I think there’s definitely some new stuff here. The interior looks great, but I still think there’s a bit too much bright work…don’t get rid of all of it, but just dial it down from 11. Otherwise, I think it looks simple, clean, and comfortable. I can’t wait to sit in it and see how the dual touch-screens work, vs the dial-wheel. Any word on when a PHEV or BEV version will be available? Typical Audi design but it does look good. Much better than the A5. If it is real pictures it looks better than A8. I really like the interior. World class design. But the exterior… it’s like nothing has happened for two decades. A lot of people don’t realise “the same style, different size” approach that Audi has taken the last few years was to establish a unified look to get the brand known in China where they were little knwon when they started out. The idea worked because Audi is now regularly the number 1 premium brand in China. Now that the brand is known they’re slowly moving away from that approach. I see they’ve borrowed the boring design from the A8. bored bored bored bored bored bored bored bored ………..!!!!!!! 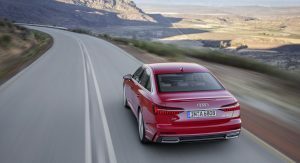 “Audi is an autonomous driving pioneer” That’s a bit of a loaded statement to blurt. Can car companies STOP designing fake exhausts, its like saying im a man but my testicles are plastic. Make an appealing rear design WITHOUT a fake exhaust hole, do they think common consumers are that stupid? for me it ruins the whole essence of the car, like someone who got cheap and crappy plastic surgery. Look at Tesla, rear end looks fine without fake exhaust pipes, its electric but point is they didnt consider drawing fake exhausts. Audi had the sleek retractable displays (not including Audi Virtual Cockpit). Now they’re comparable to Infiniti’s interiors, but with Audi Virtual Cockpit still. German design to Japanese smh. …Still want one. By far the best out of the 5er and E-Class. 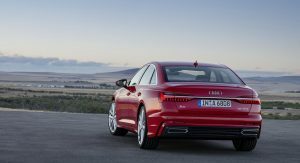 Front of the car is similar to any other Audi models, but the back of the car is interesting and differentiates itself from other Audi models. All in all a nice exterior design. Interior has of course the high quality of materials, but as almost everyone has pointed out here, having touchscreen is not a very good design idea. Lovely car. Now how about finally just scooting that engine back a few inches? Looks better over the new a7 imo since the tailights are seperated unlike the a7. Like the a8/a7 the interior is a mixed bag for me, some things I really like but the two promenant lcd screens hamper the luxurious aspect though I get it that the majority who buy these cars love them. 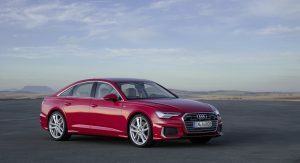 Interested to see how sporty a drive it is from reviewers since I thought Audi stated they are aiming for a more luxurious ride except for the rs variants. You didn’t come across the wrong way at all. I knew right away you were just asking and that we could converse intelligently. I enjoy reading your comments and have a lot of respect for you and some of the other regulars on here as well. I like coming to this site. I like the comments of different opinions as it helps me to look at things differently and I learn things here too. Of course there’s always some new guys or fan boys of particular brands that like to jump all over people of different opinions. They’re on here for one day or a week or so and then you never see them again. Or they only comment on posts that are about one particular brand…LOL But I enjoy the “regulars” on here. I like reading their differing opinions and have respect for them as well. I completely agree with what you wrote and value your comments and what you bring to the table as well. That car in the picture will cost way over 100 grand in europe! We are discriminated! I used to call these Audis “boring”, but their new models are starting to look seriously good. This actually wipes the floor with the new BMW 5-series. Great job, Audi !